New York, NY (September 9, 2014) – New York City’s top architecture and engineering design firms will elevate playing with food to an art form when Canstruction® fills Brookfield Place this November with spectacular sculptures made of canned food that will then be distributed by City Harvest to nearly 500 soup kitchens and food pantries across New York City. Now in its 22nd year, Canstruction®, the world’s most imaginative food charity, raises hunger awareness by challenging 27 teams to transform more than 100,000 cans of food into elaborate pop art masterpieces The gravity-defying feast for the eyes will be on display in the Brookfield Place Winter Garden and 250 Vesey Street lobby from November 6th to November 20th in what has become one of the Thanksgiving season’s most beloved events and food drives.While admission is free, visitors are encouraged to donate high-quality, non-perishable foods (such as tuna, beans, and canned vegetables). Serving New York City for more than 30 years, City Harvest, the world’s first food rescue organization, works with Canstruction® each year to distribute all canned goods from the competition. Last year, City Harvest collected over 79,000 pounds of food, helping feed more than 26,000 hungry families in New York City for a day. Each team spends months planning and designing their entries, but are only allowed one adrenaline-filled night to meticulously stack and color coordinate cans into ingenious and playful feats of engineering. While this year’s designs are under strict lockdown until the unveiling on November 6th, last year’s competition included sculptures inspired by Sharknado, Despicable Me, Star Wars, Andy Warhol, and Pixar’s Up. Teams will vie for top honors in categories including Best Use of Labels, Best Meal, Structural Ingenuity, Most Cans, and Jurors’ Favorite. Winners are chosen by a team of judges culled from the architectural, design, and culinary fields. The public will also be able to vote on the People’s Choice Award via Facebook. 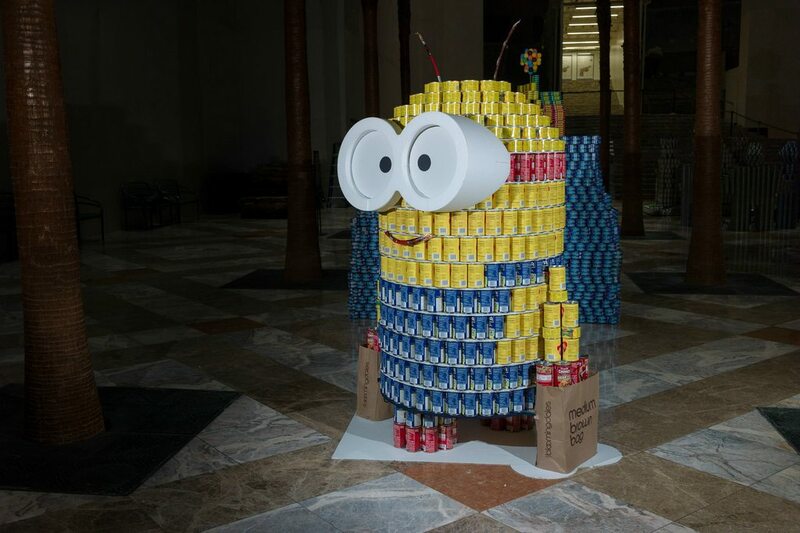 “The Canstruction exhibit should be viewed in person to appreciate the impressive scale and grandeur of the sculptures,” said Amy Nanni, CDFA, Co-Chair of Canstruction New York. 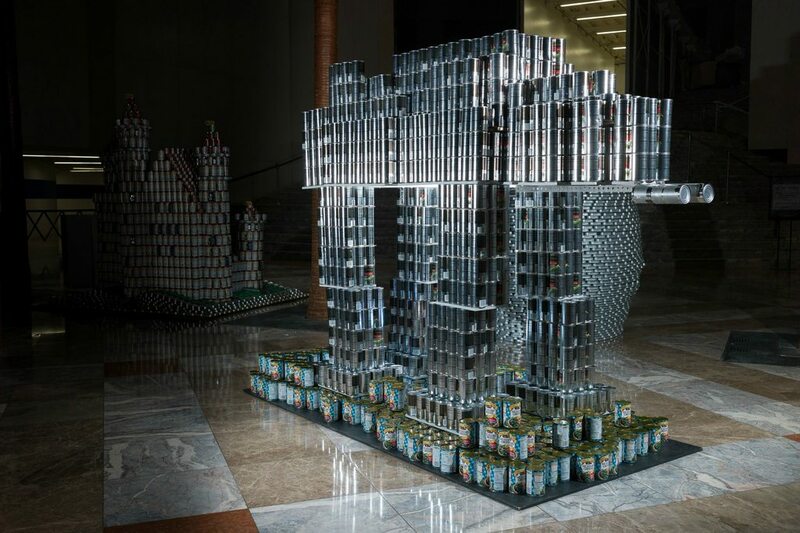 New York is one of more than 150 cities around the world taking part in Canstruction® International Competition, which has donated more than 25 million pounds of food to local hunger programs since its founding in 1992. Canstruction is hosted in New York City by Arts Brookfield and produced by Canstruction® New York, Inc., and the New York Chapter of the Society for Design Administration. Canstructionwill remain on display November 6th – 20th, 2014, from 10am to 6pm daily and until 5pm on November 20th in the Winter Garden and 250 Vesey Street lobby of Brookfield Place. Arts Brookfield presents exciting, world-class cultural experiences to hundreds of thousands of people for free each year in both indoor and outdoor public spaces at Brookfield’s premier office properties in New York, Los Angeles, Denver, Houston, Toronto, Perth and Sydney. From concerts, theater and dance to film screenings and art exhibitions, Arts Brookfield brings public spaces to life through art. Through December 2014, Arts Brookfield celebrates its 25th Anniversary through an interactive initiative, Art Set Free. The public is invited to submit original artworks of all kinds for digital display at Brookfield’s office properties around the globe and on www.ArtsBrookfield25.com. Americans for the Arts has named Brookfield and Arts Brookfield a BCA 10 2014 honoree, Best Businesses Partnering with the Arts in America. Brookfield Place is being transformed into a curated shopping and dining destination in Lower Manhattan as part of a $250-million renovation. In addition to Hudson Eats, Le District, a 25,000-square-foot French-inspired marketplace operated by downtown hospitality group HPH, will open along with leading fitness club Equinox within the year. In 2015, five restaurants, including Parm and a new culinary concept from Iron Chef Jose Garces, will provide table service and al fresco dining. The final addition of world-class luxury houses Hermés, Salvatore Ferragamo and Ermenegildo Zegna and top fashion brands Calypso St. Barth, Theory, Michael Kors, Diane von Furstenberg and Scoop in the spring of 2015, will revolutionize the luxury shopping experience in New York City. Conceived by the Society for Design Administration (SDA), Canstruction® is a trademarked design/build competition currently held in cities throughout North America and countries around the world including Australia. 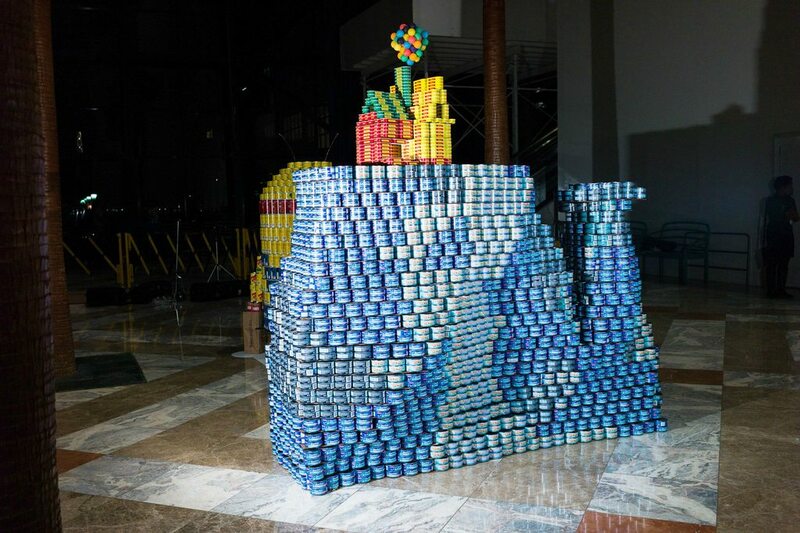 Teams of architects, engineers, and students mentored by these design professionals, compete to design and build giant structures made entirely out of canned foods. 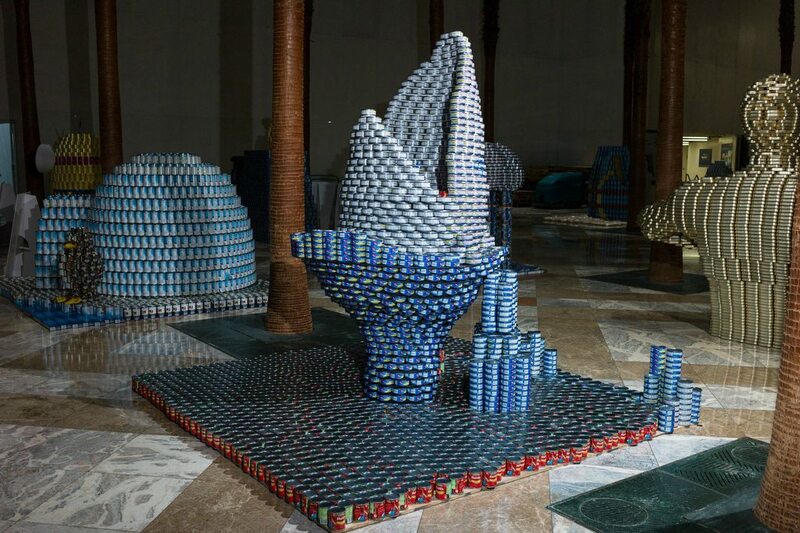 It takes 8-12 weeks of design time and thousands of cans of food to create a structure that is actually built in a single night. The results are displayed to the public as magnificent sculpture exhibits in each city where a competition is held. The public is invited to donate canned food at the time of the exhibition. At the close of the exhibitions all of the canned food used in the structures and collected from the viewing public is donated to local food banks. 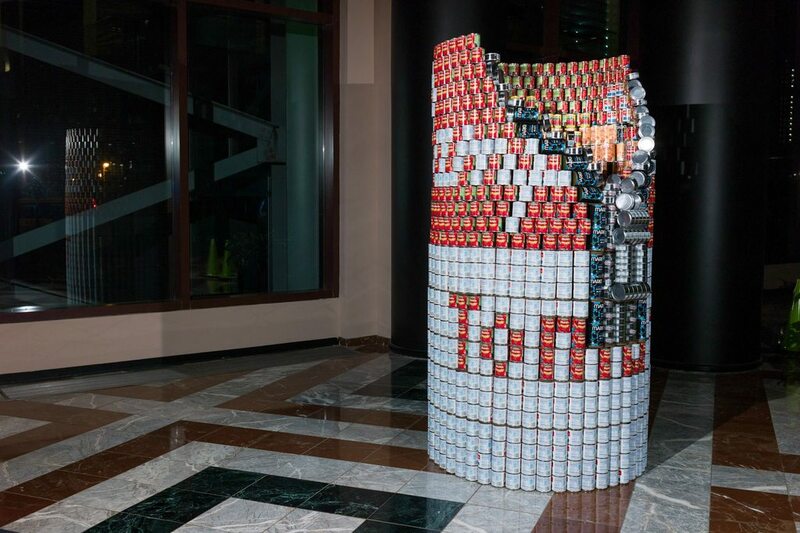 New York is one of more than 150 cities around the world taking part in Canstruction® International Competition, which has donated more than 25 million pounds of food to local hunger programs since its founding in 1992. Now serving New York City for more than 30 years, City Harvest (cityharvest.org) is the world’s first food rescue organization, dedicated to feeding the city’s hungry men, women and children. This year, City Harvest will collect 50 million pounds of excess food from all segments of the food industry, including restaurants, grocers, corporate cafeterias, manufacturers and farms. This food is then delivered free of charge to more than 500 community food programs throughout New York City using a fleet of trucks and bikes. City Harvest helps feed the nearly two million New Yorkers who face hunger each year.